. 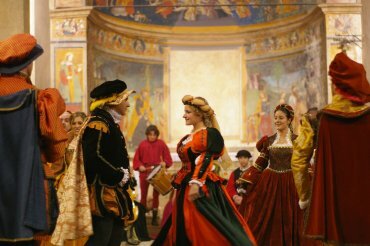 :: TRES LUSORES :: Italian Renaissance Dance :: The History ::. The Italian Renaissance Music, Dance & Art Company Tres Lusores, founded in 1998 by Tommaso Ducci, was created to make the musics, songs, dances and arts typical of the Italian Renaissance known in Italy and worldwide, in particular those of Latium. At first, an intense study was done to search and arrange the dances and musics typical of a period comprised between the 15th and 16th century and on December 1997 the first performance took place succesfully inside the Renaissance chapel of the Crusifix located in the Church of Saint Olive in Cori (Latina). The performance of the Company is the result of the important cooperation with some teachers of the National Academy of Dance of Rome who created, together with the dancers, an interesting dance program taken from the wide repertory of the manual of the Renaissance masters. In particular, the Company has paied continuous attention to the "L'Arte del Ballare ò de i Balletti" Historical Reenactment of the dances described in "Il Ballarino" (1581) and "Nobiltà di Dame" (1600), M° Fabritio Caroso da Sermoneta treatises. He was from Sermoneta, and he was a dancer, a teacher and a dance theorist lived in the second half of the 16th century. The dances described in the two treatises, with courtier titles (Alta Regina, Ardente Sole, Chiara Stella, Gloria d'Amore, Bella Gioiosa, Leggiadra Ninfa, etc. 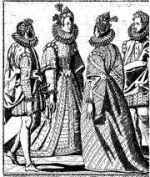 ), are markedly dedicated to Queens, princesses and noblewomen from France, Spain and Italy. However, the Company has not disregarded the study and the presentation of some of the most famous dances of other Renaissance teachers. The performance put on stage, with splendid clothes accurately reproduced on the basis of iconographic sources of the time, leads the audience directly (and surprisingly!) to the Renaissance period, among the musics, songs, dances and ancient arts, in a world where the magic mood of the court are taken back to life again. Some dances are introduced together with wonderful masks of the Renaissance inspired to the famous Carnival of Venice, considered that Caroso was a guest of the beautiful city of Venice. The Company has paied also particular attention to the dances and to the popular musics of the same period, dances and rythms, that is those orally handed down during the centuries. A particular relief has been given to the saltarello romano, a popular dance of the Renaissance of the Roman countryside, from which some of the most important court dances of the period took inspiration. 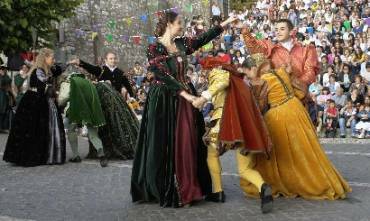 The sequence of the different dances is connected by a court jester who steps in every now and then and by a noble woman who recites some verses of famous poets and writers of the Renaissance. The musics, performed by the Instrumental Ensemble Fanfarra Antiqua based on faithful copies of instruments of that period (harpsichord, lute, viol da gamba, flutes, ciaramella, shawm, clarions, drums, tammorra) and the songs are taken from the most common printed collection. The performance includes also some highly choreographic moments played by maestri bandierai (expert person who does some coreography with a flag) presenting the ancient Arte del Maneggiar lï¿½Insegna, one of the military arts performed by noble people in the late Middle Ages and in the Renaissance, which shows the everlasting fight between the Good and the Evil. This performance, unique in its gendre, is having excellent consensus from the Italian people and from all over the world, thanks to skilled dancers, musicians and to all the artists of the Company whose expertise is nationally and internationally appreciated. It took part to the National Contest of Ancient Dance held in Narni (ranking first), to the Festival Euro Mediterraneo held in Rome, to the Nicosia International Folk Dance Festival in Cyprus (Special Price for the choreography and costumes), 10th CIOFF Asian and Oceanian Art Festival and 2009 Hangzhou International Carnival in Hangzhou CHINA (the Best Performance Award). The Company is in Cori, a very old town, 50 km south of Rome, and recognized for its high artistic value by the CIOFF Italia.